How Can 3D Printing Be Used In Fashion Jewelry ? The production of various ornaments and jewelry is one of the dynamic industries that have incorporated 3D Printing Technology. Thousands of jewelers and goldsmiths all over the world are relying on this 3D Printing Technology to effectively reform the way the jewelry industry performed a few years back. Moving over CNC Machining in many cases, this technology can now create intricate patterns for investment casting, thus being able to print even complex jewelry directly. This Blog Post Will Give You Everything You Need To Make Cool Fashion Jewelry & The Technologies That You Can Use To Manufacture In 3D Printing. 3D Printing Technology Is Very Good If You Consider The Production Lead Time, Which Is Drastically Reduced Due To The Advancement In 3D Printing Which Is The Ideal Candidate For Jewelry Making. Before getting into the applications of 3D Printing Technology in the jewelry industry, let us have a look into the conventional manufacturing processes of jewelry to get an idea about the underlying activities. Usually, a process called investment casting or lost-wax casting is the man principle behind jewelry manufacturing. The Surface Finish Should be Excellent to Ensure That There is Proper Luster and it is Artistically Eye-Catchy. The Material Should burn instantly leaving behind Minimal Residue. 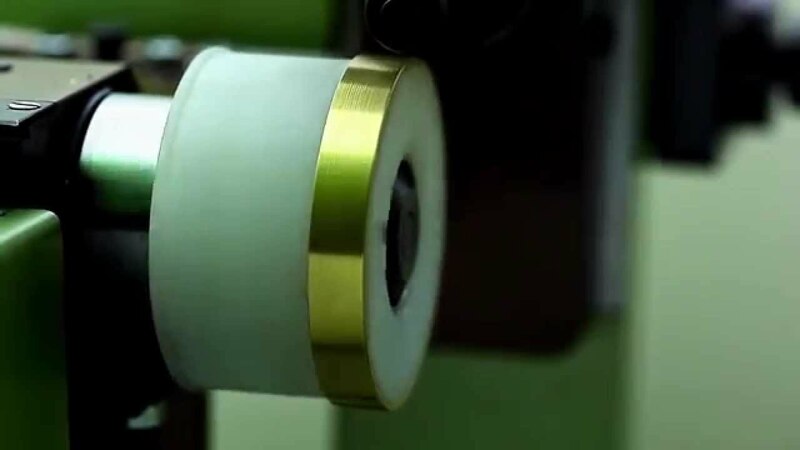 The Material Should Be Durable & Withstand Thermal & Mechanical Loads. All such properties ultimately point to wax which exhibits almost all of these outstanding qualities. Designing of the parts of the jewelry in CAD software. Prototyping using CNC machine so as to carve a wax part in the shape described in the CAD file. Casting of the models by dipping them in a ceramic slurry. The liquid metal is poured into the runner. This metal helps in the burning and simultaneous evaporation of the wax to solidify into the required shape. Surface finishing is done, if and when required. You will not find designers in the market who are talented in the art of jewelry making. It’s common that most of the jewelers resort to copying the designs of various branded jewelry designs. Insufficiency of skilled labor makes the whole process economically less productive. Also, there are numerous shapes which are almost impervious for CNC Machining. With these obstacles, there emerges the need to implement 3D Printing in the production of jewelry. As we discussed earlier, various jewelry patterns were cast using the wax material in CNC machines. Since 3D Printing is not impeded by the restrictions of CNC Machining, it can easily create complex designs which were in earlier stages, hard to design. The creation of multiple patterns within the specified time period is possible via 3D Printing. Thus, as compared to the traditional jewelry printing patterns such as wax CNC machining, the lead times and the overall cost of printing can be remarkably diminished. There is also the provision of generating numerous designs while working upon a single print. This makes the low production demands possible and makes them very cost-effective as well. Now, having understood the necessity of switching to 3D Printing Technology from conventional jewelry producing methods, we can now look at how the whole 3D Printing techniques work. You will find in the current scenario that the jewelry items can be 3D Printed by the implementation of Investment Casting and Direct Printing techniques. Both in traditional and the modern 3D Printing processes, Investment Casting is the most popular and suitable method to produce jewelry. As we have seen earlier in this article, the patterns were formed by letting a suitable casting wax gush into a metal mold. 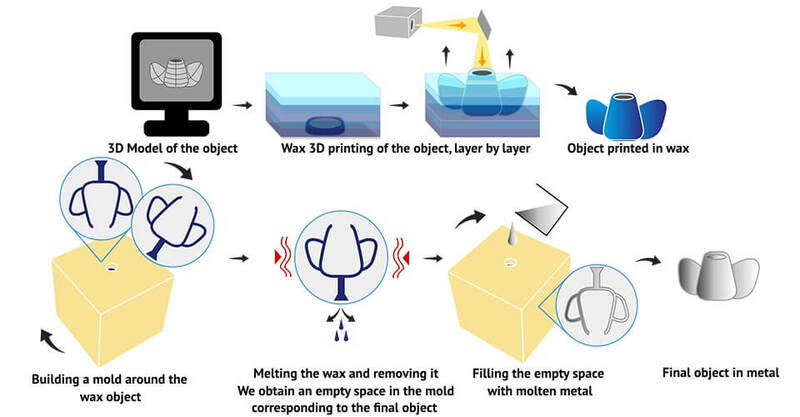 With 3D Printing, the pattern can be directly generated from wax or from resin which can be properly cast. The use of a casting tree to assemble the molds or the printed patterns in the case of 3D Printing allows the easy casting if numerous parts simultaneously. In some 3D Printing Techniques, the patterns and the tree can be simultaneously printed in a single step. After meticulous assembly of the pattern, the complete assembly is subjected to slurry as many times a required. This slurry layer formed on part is then dried with further solidification so as to generate a layer of ceramic material on the outer surface of the pattern. The melting or to speak technically, the burning out of the primary wax or resin structure is done in a furnace. This process is implemented to produce a hollow contravening mold or cavity. After the removal of all the primary pattern substance inside the ceramic cavity, formed during the burnout process, the ultimate casting material is cascaded into the mold, which is further subjected to efficient cooling and solidification. Usually, in the finishing stage, parts are cast using brass, which is then electroplated with the valued metals. The exterior ceramic mold, thus generated should be discarded by subjecting the mold to vibration which results in the removal of the outer shell. With the removal of the outer ceramic shell, each cast item is segregated from the casting tree. The resulting cast parts are then administered with the conventional finishing methods adopted by jewelers. To successfully complete all the above-mentioned stages required for the investment casting technique to produce jewelry, various pre-requisite steps are necessary. Firstly, the technology adopted must be efficient in generating the parts with excellent details and precise elaborate features. Secondly, the materials used during the printing process should be capable of being entirely utilized at the burnout stage. If there are any leftover parts of the basic pattern material left, then these might have a deleterious effect on the attributes of the final part cast. To adhere to these requirements necessary for generating 3D Printed patterns using the investment casting process, we have listed below the efficient technologies and the suitable materials for the use of such technologies. SLA or Stereolithography is the 3D Printing technique in which the build platform is immersed in a tank consisting of liquid photopolymer resin. After the submerging of the build platform, a laser lays out the design of the cross-sectional area of the layer through the tank’s bottom, thus making the material solid. After the solidification process, the platform is uplifted, thus facilitating a new layer of resin to flow. This process keeps on continuing layer by layer to generate a solid part. These parts are then photo-cured by projecting UV light in order to enhance their mechanical properties. DLP or Direct Light Processing is also similar to the SLA method of printing various parts. It varies from SLA such that DLP incorporates a digital light projector display system which reflects the image of each layer altogether. The projector being a digital screen, the image of the subsequent layers consist of square pixels, which looks like a layer comprising of minor rectangular structures, known as voxels. Thus, it is more efficient than SLA in generating faster prints because, in the DLP technique, the complete layer is targeted instead of focussing on the cross-sectional area as in SLA technique. These 3D Printing techniques are categorized under Vat Photopolymerization where a photopolymer resin is exhibited to the light of a certain wavelength and is subjected to chemical reaction to undergo solidification. Thus, these 3D Printing processes are able to generate smooth, intricately designed parts using castable resins which have minimal ash content and burnout residues. There is a requirement of the support structure in both SLA and DLP to print the parts flawlessly. Although this is a mandatory requirement, the support structures should be removed as soon as the prints are completed. Drop-on-demand or DOD technique is a method of material jetting. In this process, there are two print jets used, one for the deposition of wax-like material all over the build area, and the other one for accumulating dissolvable support. With the subsequent deposition of each layer, gradually a solid part is created. With DOD Printing Technique, there is excellent detailing observed in the jewelry parts. With the provision of dissolvable support, there is a requirement of minimal post-processing and establishment of outstanding surface finish of the pattern. The use of wax-like material for printing the patterns leads to melting instead of burning out, thus replacing the problems associated with resin ash. This DOD 3D Printing Technology makes use of the Solidscape Model and Support for investment casting which is produced by Solidscape. The direct printing technique for producing jewelry from metal powder is, in fact, less popular and is comparably expensive. Although you can print the parts using gold, silver, or platinum alloys and can thus be excited to have jewelry made up of gold or silver at your hand within few minutes of creating the CAD model, the very idea of these materials being overpriced is a major drawback. The necessity of mandatory amount of post-processing to achieve the suitable surface finish makes it more costly. Furthermore, be it for a whole part or for a single piece, Direct Printing Technique requires efficient powder management, thus making the whole process highly expensive. DMLS (Direct Metal Laser Sintering), or SLM (Selective Laser Melting) are the Powder Bed Fusion technologies meant for producing the metal parts. In this Powder Bed Fusion technology, a solid part is generated by making use of a thermal source which facilitates the fusion of the constituents of a plastic or more commonly, a metal powder layer by layer. For the accurate production of parts using this DMLS or SLM technique support structure is essential. With the increase in temperature, high amount of stress is generated which makes the parts responsive to warping or distortion. This, in turn, generates the requirement of effective post-processing for support removal and surface finish. DMLS technique makes use of ALNP000 18L3N Yellow Gold Powder for direct printing of jewelry parts which is produced by Cookson Precious Metals. 3D Printing doesn’t have much application in the design of an object. Irrespective of using the CNC or 3D Printing machines, the design is going to be created in a CAD software. However, it is to be kept in mind that while using CNC, you have to be careful about the working compatibility of the machine and choose the design accordingly. On the other hand, with 3D printers, you can experiment with the designs according to the technology used. Prototyping is the stage where 3D Printing Technology has its dominance. The professional jewelers can no doubt, save the time and costs of making jewelry piece using 3D Printing. Before developing the final design for a particular jewelry item, you can always come up with a cost-effective prototype which not only saves time but also makes you confident about the piece that you are going to build. The introduction of SLA based printers using wax as the printing material by Stratasys has set a new level for making patterns using investment casting. Thousands of copies can be generated simultaneously using the 3D printers. You can now have an actual jewelry piece at your hand using metal 3D printers. Although metal 3D Printers are generally costly and is still now an overpriced technology, due to the use of gold, silver, or other metal items for the creation of a jewellery part, those who are willing to go for having a metal part directly at their reach, can look for 3D Printing services provided by Shapeways and Sculpeto and send their designs to them. The availability of valuable materials such as silver, gold, or platinum items can help you directly design your items. There are various restrictions on the size of the details and the features that the previously mentioned 3D Printing technologies are capable of producing. For SLA or DLP technology, the minimum detailing size is 0.2 mm and the minimum feature size is 0.3-1 mm. For DOD technology, the minimum details and features size is 0.25 mm. For DMLS technology, the minimum detailing size is 1 mm and the minimum feature size is 1-3 mm. Be it any investment casting technique, ensuring that there is appropriate burnout occurring is paramount to the development of high-quality cast parts. If the burnout is quicker, then the resin will expand simultaneously undergoing combustion. This, in turn, will damage the surface subjected to investment casting and thus the minute details of the casted parts. On the other hand, if the burnout doesn’t reach the required temperature, there will be resin and ash residue thus resisting the proper metal flow and the surface finish. To achieve highly effective 3D Printed casts, look at the free white paper provided by Formlabs. With this, you will also be able to develop the concept, design, and various orientation details required for jewelry casts. Installation of support system is a must for producing jewelry parts. In DOD, there is a dissolvable support system. In SLA and DMLS technology, the support system requires to be manually discarded. The Boltenstern jewelry located in Vienna, Austria have inculcated 3D Printing Technology to generate customized pieces as seen in the “Resonance” series. These pieces are designed to perfectly fit the body part these are meant for. This 3D Printed jewelry collection consists of numerous 3D Printed scales which are collaborated together to ensure fluidity of the jewelry parts which are in contact with the body surface. Generating such designs with intricate parts would have been practicing very time-consuming and highly expensive. With 3D Printing, the creativity is increased and there is remarkable growth seen in the production processes. In the search to make perfect jewelry items, Graff Diamonds have adopted 3D Printing in their jewelry making processes. In their Snowfall series, they have created the most effective jewels with the help of 3D Printing. In this, they generated the jewelry pieces by initially printing them using liquid resin via SLA technology and then subjected to casting process using finest gold. The incorporation of 3D Printing technology has allowed them to experiment with the designs and continuously amaze their customers. In summary, 3D Printing has indeed proved its suitability and efficacy in the jewelry industry. Although the choice of going for CNC machining or 3D Printing for producing jewelry parts varies from person to person, one can undoubtedly explore various designs and modifications related to jewelry making using 3D Printing technology. So, would you go for 3D Printing now, to customize your jewelry parts? Previous PostMaking 3D Printed Guns Legal – Is it a Smart Move?